I know that Summer bring changes to our schedules, what with the kids being out of school, and travel, etc. I’ve come up with what I think is a really awesome way to encourage you to keep coming to classes regularly. 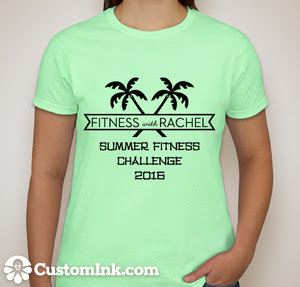 Introducing my SUMMER FITNESS CHALLENGE! For each month, June, July and August, if you attend a minimum of 8 classes, you’ll be entered to win a $25 gift card to either Coffee Bean and Tea Leaf or California Pizza Kitchen. There will be 2 winners each month! For the whole summer (June, July AND August COMBINED), if you attend a minimum of 24 classes, you’ll be entered to win a $25 gift card to both Coffee Bean and Tea Leaf AND California Pizza Kitchen. There will be 1 winner for the whole summer! There will be additional prizes for those with the highest attendance! In June, July and August the prize is a $30 Blender’s Gift Card, a $33 Blender’s Gift Card, or a Facial at the Aveda store in Paseo Nuevo ($35 value). These prizes will be winner’s choice – first won gets first pick. For the whole summer (June, July AND August), the prize is a $50 gift certificate to Louie’s at The Upham. Additionally, the top 25 class attendees for the June-Aug period will get a super cool, limited edition, Fitness with Rachel Summer Fitness Challenge 2016 water bottle! SO ADD YOUR CLASSES TO YOUR CALENDAR SO YOU WON’T BE SO INCLINED TO SKIP THEM AND MAKE A COMMITMENT TO YOUR HEALTH AND FITNESS THIS SUMMER! JOIN MY SUMMER FITNESS CHALLENGE!